S. Patmarie Bernard continues to serve in the healthcare field in facilities like Santa Maria Community Services, but says that her real passion lies with spiritual journey. Retired Sister of Charity Patmarie Bernard has spent the majority of her life in the field of healthcare, a field which she has dedicated her retirement to as well. She also shared that her true “passion” in life is the spiritual journey and continues to serve as a spiritual director/companion. She firmly believes the varied dimensions of her ministries overlap and enhance each other. In 2004, after 42 years of healthcare ministry in New Mexico and enriched by the different cultures, Sister returned to Cincinnati and felt a call to volunteer at Santa Maria Community Services, founded by the Sisters of Charity in 1897 to reach out to the needs of immigrants on many levels. Sister found her “niche” contributing to the healthcare needs. This involvement includes volunteering as a registered nurse for Santa Maria Community Services’ health and wellness clinics for seniors. She stated that while her nursing expertise is important, being present to them with love, compassion, interest and follow-up is what truly matters. Sister also serves on the Board of Directors of Santa Maria. In addition she volunteers her services at Bayley Adult Day Care and Bayley Senior Care where she serves on the Mission Integration Committee and the Strategic Planning Committee. Sister has stated that though the journey of her active ministry may have been in the healthcare field, her “passion” in life is the spiritual journey. She pursued credentials for spiritual direction/mentoring at the Mercy Center in Burlingame, California. Currently she ministers as a spiritual director/companion along with collaborating with the Sisters of Charity Spirituality Center in giving directed retreats and related workshops; one example being Backward Binoculars, looking at God’s presence in one’s life in 10-year spans. All of this, she feels, is a process, commitment in developing one’s relationship with God. 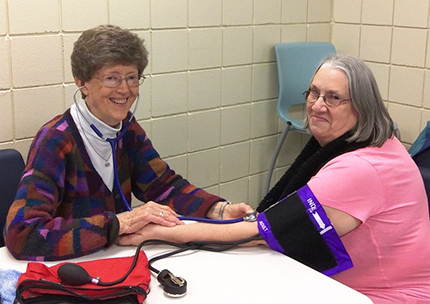 Through the course of her ministry and retirement, Sister has touched the lives of many through helping her patients with their physical health and the faithful in their spiritual wellness. Sister bids farewell to everyone by saying, “Blessings on your journey,” and all of those who were fortunate enough to have her guidance are grateful for the blessings that she has imparted on them.